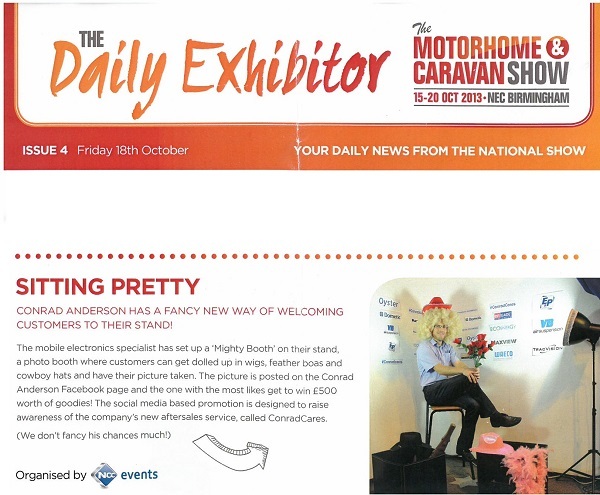 We felt like doing something a bit different at this year’s October NEC Motorhome & Caravan show so as well as our usual display of exciting products we had a new area of the stand. This new area was to launch our new aftersales service ConradCares, and was called “The Mighty Booth”. The Mighty Booth was a 2 metre corner of our stand devoted to dressing up fun! We had 4 boxes of props, wigs and funny hats, and were inviting people to dress up in some of our gear and have their photo taken. The photos were then uploaded to our Facebook page and the three photos with the most ‘likes’ win prizes. Each day’s photos are in their own album on our page here. We had lots of people taking part, some needed more persuading than others, but everyone that got involved had great fun. The winners of the competition were drawn on Friday 1st November, here are the winning photos. The top two photos were in hot competition for the number one spot but Pamela McKellar won in the end with the help of her PR machine friends and family getting a stonking 290 likes, her prize is a Waeco MSP 1012 Pure sine wave inverter. Jo Smith came in a close second with 226 likes, he won a Maxview HD satellite receiver and Keith Chinn won our third prize, a Dometic GC100 Gas checker pen with 39 likes. #ConradCares is Conrad Anderson's pledge to offer quality across the board. From the products and brands we supply coupled with accurate pre-sales technical advice and guidance, followed up with efficient aftersales service, technical support and communication. Steve Anderson, our Managing Director was representing Conrad Anderson on the VB/E&P stand as the Midlands dealer for both brands. There was a huge amount of interest in the full range of Air suspension and hydraulic levelling products on both motorhomes and caravans. 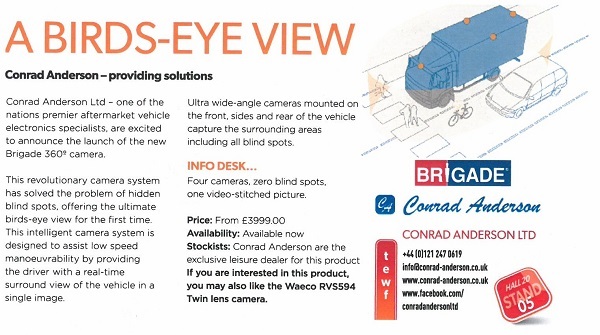 Another product we were asked a lot about was the Oyster Vision 1, this can be upgraded to a Vision 2 by trading in the control box for new ones. There’s a blog post about this too, and you can order online here. In all it was a great show with lots of interest across the board, we hope to see you at our next exhibition at the NEC in February.